Advanced fasteners hold pads securely while you work! Upgrade your backing plates to the Cyclo ProGuard Orbital Backing Plates! These backing plates replace the rubber pad holders. ProGuard Backing Plates screw directly into the Cyclo Polisher. Each backing plate has a rubber edge to guard the paint against impact, and the heavy duty fasteners have twice the grip of standard hook and loop fasteners. Use the Cyclo ProGuard Orbital Backing Plates with all Cyclo 4 inch pads. The Cyclo ProGuard Orbital Backing Plates are so advanced, they make the Cyclo even easier to use. The old Cyclo pad system consists of rubber boots that fit snugly over two orbiting heads. The pads attach to the rubber boots. Cyclo ProGuard Backing Plates have a 5/16" thread. 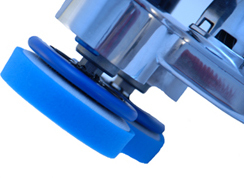 The Cyclo ProGuard Orbital Backing Plates screw directly into the Cyclo polisher, like standard backing plates. ProGuard Backing Plates have a slimmer profile than the rubber boot configuration, making the ProGuard plates lighter and more agile. The Cyclo ProGuard Orbital Backing Plates have a 5/16” thread, which fits most orbital polishers. Use these backing plates with any 4 inch pads. The Cyclo ProGuard Orbital Backing Plates are designed with your vehicle’s safety in mind. The rubber bumper around the curved edge protects the vehicle from impact. The Cyclo ProGuard Orbital Backing Plate is slightly smaller than the diameter of the Cyclo 4 inch pads to provide ¼ inch of foam around the perimeter of the plate. This edge of foam provides additional protection against accidental impact. Use Cyclo Premium Pads with the Cyclo ProGuard Orbital Backing Plates. The Cyclo ProGuard Orbital Backing Plates have an incredible grip. They hold onto pads and won’t let go! The backing plates and pads are held together with hook and loop fasteners. The Cyclo ProGuard Orbital Backing Plates feature mushroom hooks. This design creates dozens of double hooks, which provide twice as much grip as standard hook and loop fasteners. The strong hold prevents pads from flying off during use. You can be confident that the Cyclo ProGuard Orbital Backing Plates will hold onto pads until you remove them. Cyclo ProGuard Orbital Backing Plates work with all 4 inch foam and wool pads. These backing plate screw directly into the Cyclo polisher in place of the orbiting heads that come standard on the Cyclo. Protect your vehicle as you polish with Cyclo ProGuard Orbital Backing Plates. The backing plates have soft rubber edges, an advanced fastener system, and a rugged design to make polishing with the Cyclo easier than ever. 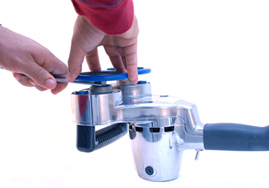 We have been using the Cyclo polishers for quite a few years. Through the years, they have taken their fair share of abuse. After rebuilding all of them over a period of about 10 years, I realized there were different backing plates on the market and had to try them. These backing plates are much better then the old rubber pads. The low profile and slim design aid in sneaking under luggage racks. These are also much more lighter in weight to reduce vibration. The best part however, is how they redesigned the hook system so it doesn't deteriorate or fall off the backing plate. Top Notch Indeed! Great Improvement over original backing plates. ProsMuch thinner and lighter and the rubber edge helps not to mar up non-work areas. I switched to the Cyclo ProGuard orbital backing plates and could not be happier. they make centering my pads a breeze and are lower profile so they fit in tight spots easier. also should last a long time since the hooks are molded right in and are not part of a fabric that might come loose like my other backing plates.